1 photograph : b&w ; 17 x 23 in. 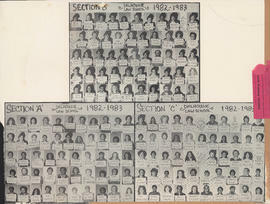 - 3 collages : b&w photographs ; 17 x 22 in. - 3 photographs : b&w transparency ; 10 x 12 in. 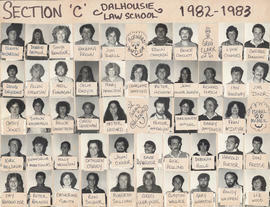 File contains three photographic collages of sections A-C of the Dalhousie Faculty of Law in 1982-1983. 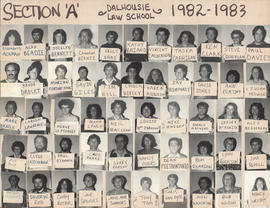 The collages consist of photographs of each student holding up a sign with their name and there is also a name tag attached to each photograph. 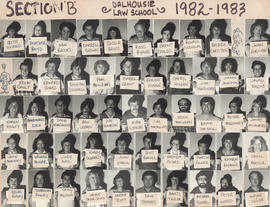 The file also contains transparency reproductions of each collage and a large photograph with reproductions of all three collages.